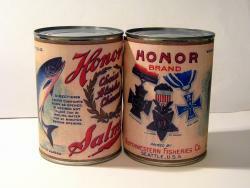 WW1 Food Rations Labels : Honor Brand Alaskan Salmon Label, 1918? WW1 Reenactments Equipment : Great War Tommy WW1 Food Rations Labels : Honor Brand Alaskan Salmon Label, 1918? WW1 Reproductions and WW1 Reenactors Equipment / Kit - Honor Brand Alaskan Salmon Label, 1918? "Honor" Brand Alaskan Salmon Label, 1918? "Honor" ( that's "Honour", in English!) Brand choice Alaskan chinook salmon packed by the Northwestern Fisheries Co. (1906) in one of their Alaskan canneries. Label features a Victoria Cross, US Medal of Honor and German Iron Cross.